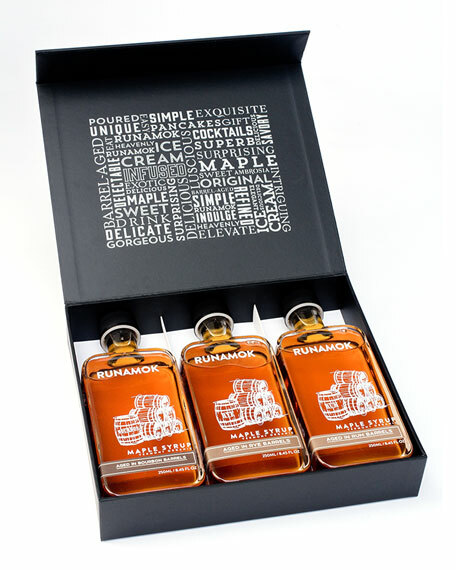 For a gift that will be appreciated by gourmets and Sunday pancake-lovers alike, we offer the Runamok gift box. For a grown-up take on waffles and ice cream, try the barrel-aged collection, featuring Rum, Rye and Bourbon Barrel-Aged Maple Syrup. Encased in elegant packaging. Set includes three bottles of maple syrup, each 250 ml / 8.45 fl. oz. 9" x 8" x 2".